The 2017 Reconnecting Youth Survey (RYS) shed a light on a group of young Santa Feans at extreme risk of low academic achievement, poor connection to the job market, and engaging in behaviors endangering their health. These youth, known as opportunity youth or reconnecting youth (sometimes referred to as disconnected youth), were between the ages of 14 and 26 years, and were not working or enrolled in school. For more information on this group of young people, see the Data Spotlight from October 4, 2018 (Data Spotlights, Focus on Education and Employment Among Disconnected Youth). As the previous Data Spotlight pointed out, opportunity youth of Santa Fe have great potential, and it is critical that our community makes a big effort to reconnect them to school and to employment leading to future careers. The current Data Spotlight focuses on one of the many risks these young people face – homelessness, or housing instability. The McKinney-Vento Act defines homelessness as lacking a fixed, regular, and adequate nighttime residence. The RYS assessed housing stability with a single question, “During the past 30 days, where did you usually sleep at night?” Respondents who answered that that usually slept “In a home that I own or rent” or “In my parent’s or guardian’s home” were considered to be in stable housing, and those who gave any other response were considered to be in unstable housing. More than one-third (35.5%) of RYS respondents lived in unstable housing. Youth ages 19-26 were more likely to be in unstable housing than ages 14-18; nearly half the surveyed population (47.1%). In the younger age group (14-18 years), 24.0% were in unstable housing, a rate 3-4 times that of public high school students of a similar age group. According to the NM Youth Risk and Resiliency Survey, 6.0% of high school students were in unstable housing in 2015, and 7.4% in 2017. During the past 30 days, where did you usually sleep at night? In most cases , only a minority of youth in unstable housing reported that they actually got help with housing. Among 14-18-year-olds, almost half (49.1%) indicated that they needed help with housing, but less than one-third (29.1%) got the help they needed. Almost two-thirds of 19-26-year-olds reported they could have used help with housing, but less than a quarter (23.5%) got the help they needed. Youth in unstable housing, of all ages, were at higher risk for factors associated with behavioral health, including substance use, suicide attempts, and sexual violence victimization. Approximately 1 in 10 young adults ages 18-25 experience some form of homelessness each year, and 1 in 30 adolescents ages 13-17 experience homelessness annually (Voices of Youth Count, University of Chicago). Young people who are not working or in school are already at heightened risk of homelessness. They are already vulnerable to exploitation, lack of services, substance use and other behavioral health risks, and without fixed, regular, and adequate housing, they can only see their risks multiply. Opportunity youth present have great potential for leading healthy and productive lives, but housing instability and it’s associated risks represent missed opportunities to help this population in their transition to productive adulthood. The data collected indicates that youth are looking for these services but are unable to access them. If we as providers listen to their voices, we can work together to provide greater access to housing, behavioral health services, education supports, and job training and support. Measure of America defines youth ages 16 to 24 who are not in school and not working as Disconnected Youth, but here in Santa Fe these same youth have redefined themselves as “Reconnecting Youth”. This redefining moment has come because these youth are saying they are here and by making their voices heard, our community can assist them in going back to school or finding a job. Whichever term is used, it is important to recognize that this is a critical segment of the population, and that there is great potential in the Santa Fe Community to come together to help these youth either return to school or find an appropriate career pathway. 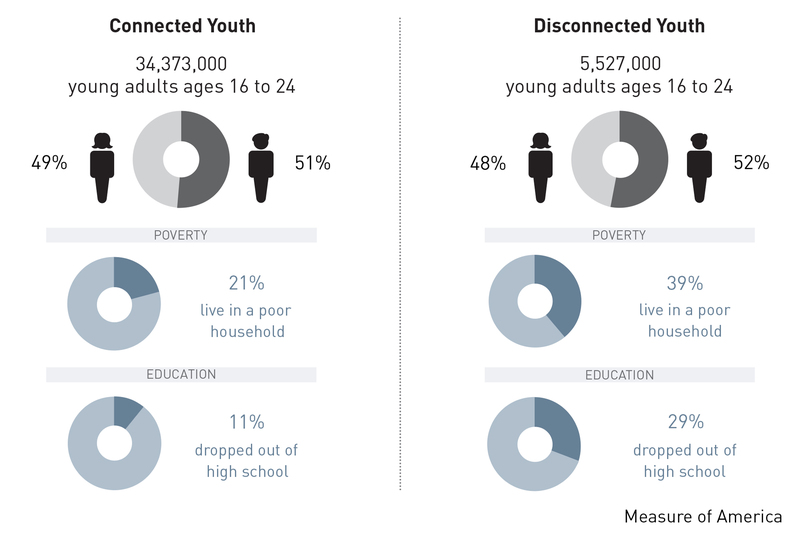 According to Measure of America's most recent report, Nationwide 11.7% of young people in this age group are not connected to either school or employment, while 16.4% of youth are disconnected in Santa Fe County. Locally, a survey called the Reconnecting Youth Survey was conducted in Fall 2017 at locations where opportunity youth tend to congregate within the greater Santa Fe area, as well as select locations within Santa Fe County. This survey included respondents between the ages of 14 and 26 years of age, and data was gathered based on the responses that the interviewees provided. The survey included questions on housing, employment, income, drug and alcohol use, challenges related to school and employment, and several other categories. With regard to education, 61% of the respondents surveyed were not enrolled in school, nor were they taking high-school equivalency coursework. Of this subpopulation of interviewees, 26.9% were between the ages of 14 and 18. Of respondents aged 19 to 26, those who were enrolled in schooling of some sort (e.g., high-school equivalency courses or courses offered at a post-secondary institution) were 1.77 times as likely to say that obtaining a diploma was “very important” when compared to their non-enrolled counterparts. The largest challenges related to school for respondents aged 19 to 26 were inadequate transportation, other family responsibilities, poor grades, or having to work rather than going to school. ​When considering employment among disconnected youth, it was reported that respondents without at least a high-school level credential (a diploma, HiSET, or GED) were 1.35 times as likely to be unemployed rather than employed. Respondents who had a high-school level credential reported higher yearly earnings than those without a high-school level credential. Respondents who had a certificate or degree from a post-secondary institution (such as a community college, trade school, or four-year institution) tend to earn more, with 47.8% of these making more than $15,000 a year. The effects of being disconnected ripples through the community. There is a social cost which impacts the community in multiple ways including though social services, the criminal justice system, and employment. Financially, young adults who are not in school or working cost taxpayers $93 billion annually and $1.6 trillion over their lifetimes in lost revenues and increased social services. The information collected in these surveys comes directly from the voices of the youth we as a community are trying to serve; they know what they need. Moving forward we hope this information is used to improve the outcomes for these youth. The Collective Impact approach is based on the idea that no single organization or program can tackle the complex problems our society faces alone. As budgets shrink and problems get bigger, it is more important than ever for multiple sectors, agencies, and entities to align efforts toward shared aspirations. One of the key elements of collective impact is shared measurement - collecting data and measuring results consistently to track our progress and learn. Toward this end, we have published Santa Fe Community Baseline Report on our shared outcomes and indicators and recently announced our 2020 Targets and Aspirational Goals at the 2017 Opportunity Santa Fe Summit. Throughout the year we will share progress and areas in need of focus through these Data Spotlights. As we continue to move toward our aspirational goals with collective actions, including through partnership with several Collaborative Working Groups (click here to learn more about CWGs and the current invitation for proposals), it is important to recognize areas where we have seen success so far. This Data Spotlight examines the achievements of our community over the past several years and provides some context for how that momentum can be carried forward. One area our community’s efforts have led to positive results is high school graduation. In 2010, the graduation rate in Santa Fe fell almost 7 percentage points, with only 53% of our high school students graduating on time that year. Since that point, Santa Fe Public Schools redoubled its efforts to reduce a dropout rate that had peaked at 7.1% in the 2010-11 school year. While those efforts led to almost a 60% reduction in the dropout rate by the 2013-14 school year, the graduation rate increased by more than 10 percentage points in 2014 from its lowest point as more kids stayed in school and graduated. Improvement in graduation rate has continued since then at an average of almost 3 percentage points per year, leading to a 71% graduation rate in 2016 that matches the statewide rate. Our earlier Data Spotlight in 2016 highlighted particularly strong improvements for certain subpopulations including female, Hispanic and Native American students. By focusing on equity gaps in graduation rate among various subpopulations and with community-wide commitment, we believe we can continue to move the needle through 2025 when we hope to achieve the GradNation national target of 90[KC1] %. Another area where we have seen tremendous success as a community is the production of post-secondary degrees and certificates. Previous Data Spotlights have shown how valuable education, especially in the middle-skills areas of associate’s degrees and 1- or 2-year technical certificates, is to the economic empowerment of our community, and between 2012 and 2015, local degree production increased by almost 50%, largely in those areas. The number of associates degrees and certificates awarded by Santa Fe Community College (SFCC) has increased by more than 75 percent over the last five years. By aligning its strategic plan to meet the community’s needs, SFCC has worked to increase the impact of each individual award as well. For instance, as part of SFCC’s commitment to collective impact through its participation in the Santa Fe Birth to Career Collaboration (SF B2C), SFCC aligned its strategic plan to B2C career success goals by including the number of healthcare certificates and degrees awarded as a key performance indicator, and the approach has been paying off. While our institutions of higher learning deserve praise for serving the community’s needs in this way, other data from SFCC suggest external circumstances including Great Recession of 2007-2009 may have played an important role in the success shown in numbers. Likely prompted by the economic downturn when high unemployment can reduce the perceived opportunity cost of attending school full-time , the student population shifted to being much more full-time than it ever had been previously. At the start of the Great Recession, only 16% of SFCC students were attending school full-time. By 2013, twice as many students – or 32% of the college’s population – took 12 or more credit hours. More students aggressively pursuing their degrees or certificates certainly contributed to the exceptional growth in the number of awards produced in that time period. Since 2013, which is also the high-water mark for student credit hour enrollment at SFCC, the full-time enrollment trend appears to be reversing itself. ​​Though it might seem less ambitious than our goals for high school graduation, the aspirational target to produce 1,400 degrees and certificates annually by 2020 recognizes both the uncertainty in enrollment trends as the economy continues to improve and slow population growth rates for Santa Fe County. Expected closing of University of Arts and Design and resulting loss of graduates in its bachelor’s degree program is another factor to consider. To maintain and even modestly increase the high levels of local post-secondary awards by 2020 will take continued commitment from our community. Outcomes across the birth to career continuum are interdependent with each other, with successes or failures in one area having considerable effect in other areas – sometimes immediately in numbers or ratios and other times in the long term or even intergenerationally. Take, for instance, one of our other aspirational goals to increase the rate of high school graduates who enroll in college or certificate programs. The flat trend in the number of high school graduates enrolling college coupled with rapid increases in graduation rate has resulted in the decline in the rate of college enrollment rate over the past several years. If we are able to reverse this trend and meet our aspirational goals in college enrollent rate with continuing increase in our high graduation rate, we could see twice as many students going on to college in 2025 than we do today. If those students were then successful in completing their associate’s degree on time at SFCC or another local institution, we could see degree production increase by up to another 282 awards per year by 2027 or 2028. This perspective highlights the importance of not just focusing on high school graduation rate as an indicator for student success as community, but making sure that the graduates are ready for the next phase in their lives and transitioning into college or certificate programs that set them on track for future career success. In the current Data Spotlight, we turn our focus to the relation between income and educational attainment. Educational attainment is a pathway to increased personal income. Particularly for young adults in Santa Fe’s workforce, data shows that spending even a single year in college increases earnings by 24% on average, and the jump in earnings between an associate degree and a bachelor’s degree is over 42%. Those with a bachelor’s degree on average have an annual income twice as high as those with a high school degree or equivalent. Apart from increasing the standard of living at the individual level, higher familial income is often related to improved outcomes for children and helps strengthen the overall economy. While education advances economic mobility for individuals and families, what is concerning is the fact that younger adults in Santa Fe have increasingly lower rates of educational attainment when compared to older adults. Data indicates that 1 in 5 or 20% of adults ages 25 to 34 in Santa Fe do not have a high school degree. 80% of adults ages 25 to 34 are at least high school graduates or equivalent compared to over 90% for adults older than 45. Moreover, only 25% of adults age 25 to 34 have a Bachelor’s degree or higher compared to 45% of adults age 45 to 64. Nationally, 36% of adults in the 25-34 age range have a Bachelor’s degree or higher. Our data analysis on Mean Income by Education Level in Santa Fe County for Adult Ages 18-34 was conducted using the American Community Survey (ACS) Public Use Microdata Sample (PUMS) data sets here. While PUMS provides a useful tool to help answer deeper questions that require detailed demographic data disaggregation and analysis that aren’t available through the standard ACS published data, the small sample size (only 1% of the population) introduces the potential for sampling error. For this reason, the graphs in this Data Spotlight include estimated margins of error. In general, when the margins of error from two estimates overlap, the two estimates would not be considered statistically different from one another. ​In this month’s e-news we are focusing on post-secondary success. Santa Fe is served by seven different local area institutions of higher education. Santa Fe Community College (SFCC) is the largest of these in terms of degree and certificate production, and the data below illustrates SFCC’s recent successes and ongoing challenges. The number of associates degrees and certificates awarded by SFCC has increased by almost 75 percent over the last five years. By aligning its strategic plan to meet the community’s needs, SFCC has worked to increase the impact of each individual award, as well. For instance, as part of SFCC’s commitment to collective impact through its participation in the Santa Fe Birth to Career Collaboration (SF B2C), SFCC aligned its strategic plan to B2C career success goals by including the number of healthcare certificates and degrees awarded as a key performance indicator, and the approach has been paying off. ​Even with this success, there are more opportunities for improvement. By focusing on its student demographic data, SFCC has started to identify and target equity gaps, notably for Hispanic males. Not only are Hispanic males underrepresented on campus relative to the surrounding community, once enrolled they face challenges to the successful completion of their programs of study. As a result, Hispanic males have until last year consistently made up a smaller share of graduates than might be expected from enrollment figures. Recognizing this demographic trend, SFCC began tracking Hispanic male enrollment as one of the key performance indicators used to inform the success of its efforts to bridge the equity gap. There is also an opportunity to examine the extent to which recently-improved graduation trends address an existing gap between local job openings and qualified applicants in middle-skills fields with potential for high starting wages. Focusing on equity gaps in higher education attainment recognizes the vital role each segment of our population plays in creating a vibrant and strong community. Bridging this gap directly impacts the individuals we reach by decreasing the chance and length of unemployment and increasing lifetime earnings. Indirectly, the benefits extend much further within the community, both through the positive economic feedback of those increased earnings and an increased likelihood of post-secondary success for the individual’s children or family. In addition to other initiatives targeting the equity gap, Santa Fe is part of My Brother’s Keeper, an initiative designed by the Obama Administration to address opportunity gaps for young men of color and ensure that all young people can reach their full potential. In this month’s e-news we are focusing on youth between the ages of 16-24 who are not in school, and are not employed. This group is also sometimes referred to as “Opportunity Youth”. Nationally, they are often referred to as “Disconnected Youth,” a term which has been defined by Measure of America as young people ages 16 to 24 who are neither working nor in school. Whatever term is used, it is important to recognize that this is a critical segment of the population, and that there is great potential in the Santa Fe Community to come together to help this population either return to school or find an appropriate career pathway. According to Measure of America's most recent report, Nationwide 13.8% of young people in this age group are not connected to either school or employment. In Santa Fe, these numbers are even higher per capita. Approximately 16%, or 2,600 youth ages 16-24 are neither in school or working in Santa Fe in 2009-20013. (See Figure Below). The percentage of youth who are not connected to school or employment increases with age. For 16-18 year olds 10% are not connected. This percentage almost doubles for 19-21 year olds (19%) and 22-24 year olds (21%) in Santa Fe. Nationally, rates of disconnection are much higher for blacks (21.6 percent), Native Americans (27.8 percent), and Latinos (16.3 percent) compared to rates for Asian Americans (7.9 percent) or whites (11.3 percent). *more here Although we do not have ethnicity rates for Santa Fe specifically, we do know that the youth living in poverty in Santa Fe are almost three times more likely to be disconnected than those not in poverty. For those youth who are already disconnected from school and work, the poverty rate is twice as high than those who are connected to either school or work at 47% (see chart below). These rates are higher than national rates, in which 39% of “disconnected” youth are in poverty. The effects of disconnected youth ripples through the community. Nationally, it costs taxpayers $93 Billion annually for lost tax revenue and social services for an estimated 6.7 million youth who are not in school or employed. Beyond the financial cost, there is a social cost as well which impacts the community in multiple ways including though social services, the criminal justice system, and employment. On the national level, the issue of youth who are not in school or employed is gaining momentum, and this is also true in Santa Fe. Many local organizations and programs such as YouthWorks, Youth Shelters, Santa Fe Mountain Center, and Santa Fe Public Schools are working to engage and support disconnected and at risk youth. Santa Fe is part of the Presidential My Brother’s Keeper Initiative which is designed to address opportunity gaps for young men of color and ensure that all young people can reach their full potential. Additionally, the Santa Fe Birth to Career Collaboration and the City of Santa Fe are working with many partners to improve, expand, and coordinate efforts. School Attendance: Why Does It Matter? How Are We Doing? What Would It Take? September is Attendance Awareness Month.​ Campaigns are underway nationally, recognizing the importance of attendance in student success and the role that everyone can play in ensuring that students attend school regularly. Research indicates that regular school attendance is associated with student achievement. When students are chronically absent (missing 10% or more of school for any reason - unexcused and ​excused), they miss out on learning opportunities critical to school success. According to Attendance Works, a national initiative focused on promoting regular school attendance: "Absenteeism and its ill effects start early. Nationally, one in 10 kindergarten and first grade students are chronically absent. Poor attendance can influence whether children read proficiently by the end of 3rd grade. By 6th grade, chronic absence becomes a leading indicator that a student will drop out of high school. Low income students are four times more likely to be chronically absent than others often for reasons beyond their control, such as unstable housing, unreliable transportation and a lack of access to health care." ​The attendance rate in Santa Fe Public Schools has been below the state average with a relatively flat trend in the recent years. ​The chronic absenteeism and habitual truancy rates (10 or more unexcused absences within a year) are also alarmingly high, particularly in high school, where more than one in three students are habitually truant and chronically absent. Chronic Absenteeism Decline in Most Grades. ​While still at quite high rates, improvements have been made over the past few years in chronic absenteeism and habitual truancy. Chronic absences declined slightly from 30.6% in 2014-14 school year to 27.9% in 2014-15 (as of May 21, 2015). The rate decreased in all grades except for in 8th grade. The decline was particularly substantial in 6th grade where the rate decreased by half from 18% to 9%. Habitual Truancy Rates Improve for Elementary and Middle Schools But NOT High School. Approximately 24% of students in Santa Fe Public Schools were habitually truant in the 2014-15 school year, significantly higher than the state's 14.3%. The overall rate has improved over the past few years for Elementary School and Middle School. However, the truancy issue is particularly prevalent in High School where 34%, or 1 in 3 students, had 10 or more unexcused absences in the 2014-2015 school year with no improvement in the past few years. Santa Fe Public School District has recently set a 95% attendance rate target, a near 4 percentage point increase compared to 91.1% in 2014-15 school year. As part of the Mission Attendance initiative, the District has implemented a comprehensive strategy led by Truancy Taskforce, including an early warning system with rigorous data tracking, a strict attendance policy with parent engagement and follow-ups on absences, placement of "Truancy Coaches" in priority schools with NM PED grant and, in the worst cases, involvement of the Juvenile Probation Office or court-ordered compliance requirements to work out critical concerns. But, improving attendance, especially reducing chronic absences, requires broad, community-wide support beyond school-enforced rules and interventions. ​Many of our community partners recognize this need and a number of early efforts are underway to help raise awareness of the importance of attendance, as well as to help remove barriers for students who are chronically absent (see this blog article highlighting relationship-based support for students and families by Communities in Schools). Santa Fe Birth to Career is currently also working with the Santa Fe Public Schools, Santa Fe Chamber of Commerce, and New Mexico PBS on a public awareness campaign which will include posters and information in school as well as social media campaigns driven by student participation. Visit Attendance Works to read the report released by Attendance Works and Everyone Graduates, Preventing Missed Opportunities: Taking Collective Action to Confront Chronic Absence to learn more about how we can all play a role and work together to ensure that our students attend school regularly and have a better chance at success. Do you have success stories and strategies to share? Contact us at info@santafeb2c.org or post a comment below. ​Posted by Katherine Courtney, Director of Collective Impact Initiatives and Joohee Rand, VP for Community Investment and Strategies, Santa Fe Community Foundation. Data collection and analysis conducted by the Santa Fe Birth to Career Collaboration (SF B2C) Data Team. ​14% Improvement But Significant Gap Remains Against National Average. The graduation rate for Santa Fe Public Schools increased from 52.5% in 2008 to 66.8% in 2015, an increase of over 14%. This improvement in graduation rate brings Santa Fe closer to the state average of 68.3%. Big Gains for Capital High School, Native American, Hispanic and Female Students. The upward trend can be seen in both of Santa Fe’s major public high schools, Santa Fe High and Capital High. Capital High School saw a 16% point increase from 2008-2015. Some of the biggest gains in graduation rate are for Native American and Hispanic students as well as female students. Graduation Rate for Native American students increased by 23% points from 39% in 2008 to 61%. Female students and Hispanic students improved by 16% and 15% points respectively. ​Biggest Gap Remains for English Language Learners (ELL) and Students with Disabilities (SPED). The graduation rate remains the lowest for ELL and SPED sub-populations. Little improvement has been made for SPED students over the past years. The graduation rate for ELLs has fallen back in 2015 to 56% from the relatively high improved rate of 66% in 2014. ​Can We Close the Gap? What Would It Take? High school graduation is a major milestone for youth on their path to career and life success. In addition to higher earning power, research indicates that educational attainment is a key predictor of health, mortality, teen childbearing, marital outcomes, crime and a range of other outcomes. ​The national GradNation campaign has a goal to achieve a 90 percent nationwide rate by the Class of 2020, with no school graduating fewer than 80 percent of its students on time. Where would Santa Fe's students be by 2020? What strategies would be needed to help close the gap, especially for students that are falling behind including English Language Learners, students with disabilities, male students, students of color and those who are economically disadvantaged? What do we know about programs that are working? Let's take a closer look and get to action collectively. ​Do you have success stories and strategies to share? Contact us at info@santafeb2c.org or post a comment below. Posted by Joohee Rand, Director of Strategic Initiatives, Santa Fe Community Foundation. Data collection and analysis conducted by the Santa Fe Birth to Career Collaboration (SF B2C) Data Team. What does opportunity look like now for Santa Fe's children and youth? As our community works together to improve outcomes for our children and youth, the infographic below (first shared at the Opportunity Santa Fe Community Summit 2015), illustrates where we are now as a community with 10 indicators across birth to career outcomes. Data shows that in some areas ("bright spots") including high school graduation rate and degree productions, we have made a real progress over the past five years. Where does Santa Fe aspire to be in 2020? What can we achieve by working together? What would it take? Commit to improving outcomes together by becoming a Collective Impact Partner. Download the following infographic in 1-page pdf format here. How are the youngest children in santa fe doing? Growing awareness of the importance of early childhood development for success later in life has brought more services to Santa Fe's youngest children and their families, including greater access to high quality PreK as well as several promising collaborations and programs. The City of Santa Fe and the Santa Fe County even passed a resolution recently proclaiming support for early childhood care and education from prenatal through ages five and recognizing May 2015 - May 2016 as the Year of the Baby. So how are the youngest children in Santa Fe doing? Are they receiving the nurturing and stimulating support they require to thrive? According to the new Baseline Report released with focus on Early Childhood, the current reality tells a mixed story. While progress is being made in some areas, significant work still remains when it comes to improving birth outcomes and ensuring that children are ready for kindergarten. Over the past year, many involved in early childhood care and education have discussed what would be appropriate outcomes and indicators that measure early childhood success including through the Early Childhood Steering Committee, the Early Childhood Indicator Project of the Santa Fe Baby Fund, the Santa Fe Birth to Career Collaboration, and the Early Childhood Sub-Committee of the Mayor's Children, Youth and Families Community Cabinet. These discussions led to consensus resulting in three key outcomes measured by six priority indicators. The Baseline Report discusses each outcome and indicator in detail. Here is the summary. Outcome 1: Babies Are Born Healthy. Substantiated child abuse and neglect cases for children under 5. Any instance of child abuse and neglect is too many. Santa Fe's rate of substantiated child abuse and neglect is lower than the New Mexico state average. However, in the past year, the rate has increased substantially. There were approximately 20 per 1,000 children or 138 total substantiated child abuse and neglect cases in 2015. Outcome 3: Children Are Ready for School. ​For more information, read the current draft of the Santa Fe Community Baseline Report 2015. Written and edited by Joohee Rand (jrand@santafecf.org), Katie Dry (kdry@santafecf.org), and Jesse Leinfelder (leinfelder@gmail.com) in collaboration with the Santa Fe Birth to Career Collaboration (SF B2C), the Early Childhood Sub-Committee of the Mayor's Children, Youth and Families Community Cabinet, the Early Childhood Steering Committee, and the Santa Fe Baby Fund. Data collection and visualization were conducted by the SF B2C Data Team with technical assistance from the UNM Center for Education Policy Research. This is a blog dedicated to "spotlighting" data to help guide collective action and impact for improved birth to career outcomes in Santa Fe. This blog is co-created by the Data Team members of the Santa Fe Birth to Career Collaboration (SF B2C).